Like a lot of good things in life, it all started with a motorcycle. An obsession with motorcycles and motorcycle gear morphed into the launch of Joe Rocket in 1994, manufacturing quality motorcycle jackets. Joe Rocket's "Phoenix" nylon jacket sold a hundred thousand pieces because the perforated, fully armored jacket was the first to provide serious hot weather protection and keep the rider cool. Then after sponsoring 17-year-old Nicky Hayden, Joe Rocket became etched in motorcycle racing culture. Joe Rocket went on to expand its motorcycle gear to include helmets, pants, luggage, boots, and gloves - all designed ahead of the curve of protective motorcycle apparel. 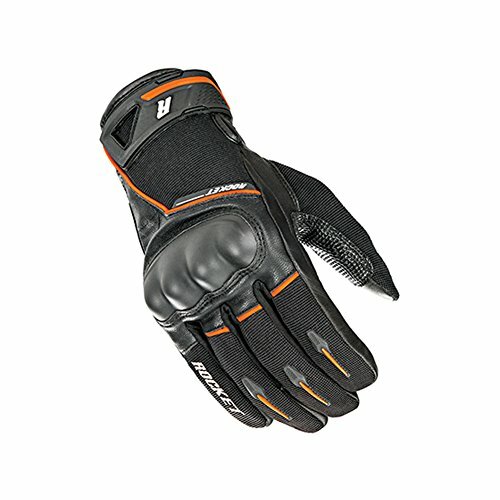 MENS SUPERMOTO GLOVE. Goatskin leather and Stretch Span/Poly construction. Drum dyed goatskin leather palm. Synthetic leather overlays on palm with silicone printed grip. Integrated TPU palm protection. Conductive materials at the finger tips and thumbs for instant touchscreen access. Pre-Curved ride friendly design. Hard PVC knuckle protector. Neoprene cuff. Secure hook-and-loop wrist closure.